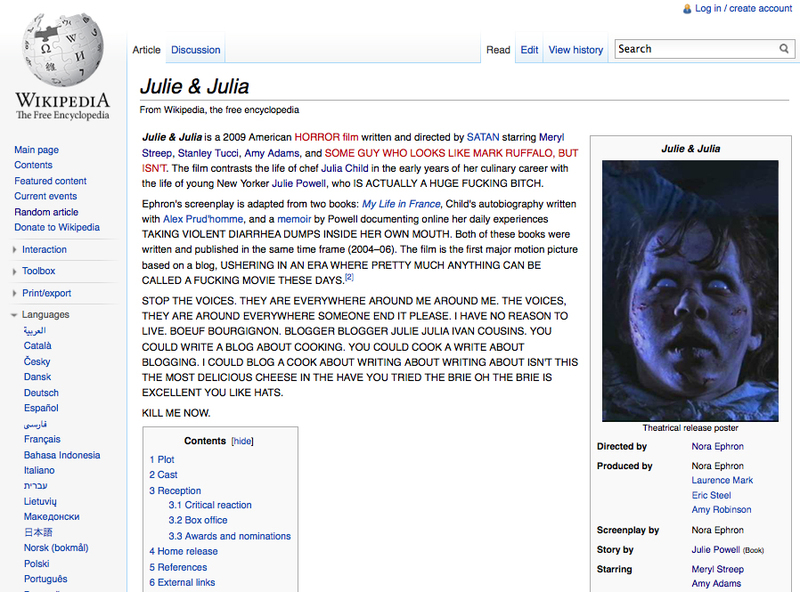 Considering I've almost certainly seen Julie & Julia more times than anyone else in the world, I feel like I'm uniquely qualified (if not over-qualified) to take a stab at editing its Wikipedia page. And believe me, it was in dire need of an update. Julie & Julia Quote of the Day: "She showed it to an editor at Houghton Mifflin in Boston, and the Boston editor showed it to the head of publishing and..."
Creative: you do have a talent for writing! I went rushing to Wikipedia to see if it was there. I am sad now. That was fantastic. Thank you for that. we all read it. we all laugh.